This vertical boiler provides steam for our working stationary engines. It dates from the 1950’s. The tubes had become life expired rendering it unusable for some time. This meant we could not have our beam engine operating. 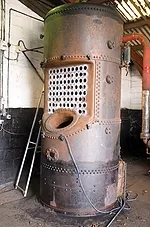 A small project led by Bressingham volunteers raised funds from within the Society and undertook retubing and other minor repair work on the boiler. 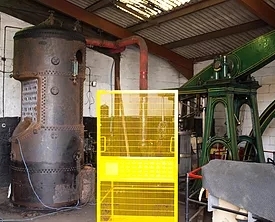 It is now recertified and able to provide power once more for the beam engine and two other stationary engines installed in the adjoining gallery. This entry was posted in Cochran Boiler on 28th February 2017 by Tim Bridge.